After working as a carpenter in Melbourne for a number of years I decided I needed a change. I wanted to do something working for myself. I wanted to do something that kept me active and interested, having a love for dogs Jim’s Dog wash was the obvious fit. 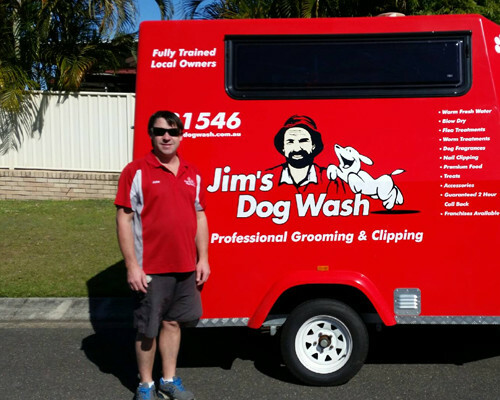 So when my wife and I moved to the Gold Coast I purchased my Jim’s Dog Wash franchise and with hard work and commitment I’m enjoying seeing my business grow. I enjoy being able to assist customers not only with your normal dog wash and dog grooming, but its also great to be able help owners take care of all of their dogs needs, from dog foods to flea and worming treatments. It’s great to be able offer care and to help my customers get results that they may not have been able to achieve on their own. So if your in the Parkwood area or surrounds and your dog needs a bit of TLC, for a great service call Jim’s Dog Wash today on 131 546 or request a free quote online to arrange for John to get in touch with you.